But it’s not the perfect comic e-reader. Japanese comics, called manga, are hugely popular. Although you probably knew that, you probably don't know the extent of it. In 2015, Japan's bestselling manga series, One Piece, sold more than 14 million copies. It helps that the format runs a hugely broad spectrum of topics; they're not just action-packed comics aimed at children but foodie series, sports, alcohol, comedy, romance and more. There are also plenty of one-off manga novels, like Steve Jobs: The Manga, to name one (ridiculous) example. It makes plenty of sense, then, for Amazon Japan to launch a special manga-focused edition of its e-reader, with faster page turning and eight times the storage for your digital manga collection. This is the Kindle Paperwhite Manga edition, in white! The storage has been cranked up to 32GB, and Amazon says the device can flip through pages 33 percent faster than its predecessor. And while it has eight times the storage space of existing Kindles, the rest of the spec sheet remains unchanged -- same screen resolution, same brightness, same weight, same dimensions. In fact, it even slots nicely into my existing Kindle case. It's impressive that the company has managed to keep the weight identical to the existing Paperwhite; presumably other components have been swapped to lighten the device regardless of the storage increase. The Manga edition does, however, cost 2,000 yen ($19) more than the standard Kindle Paperwhite. Amazon shoppers have been able to buy manga and comics on Kindle devices for several years now. Fortunately, most manga series are grey-scale, making them ideal for a Kindle's e-ink display. There are a few drawbacks, however. Relative to typical books, these all-image comics take up a lot of file space, regardless of their monochrome design. Standard Kindles have roughly four gigs of storage, but when you're trying to read an entire comic-book series, that's not gonna cut it. (Even the high-end Kindle Oasis has the same storage as Amazon's entry-level readers.) 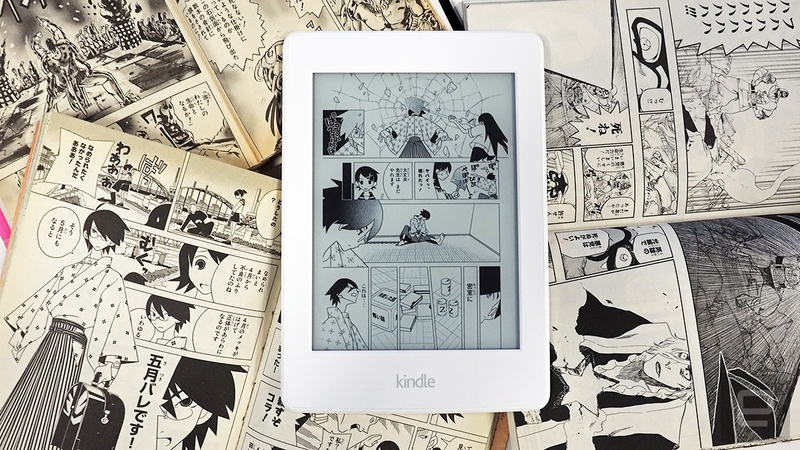 With a smartphone-level 32GB of storage, the made-for-manga Kindle can cram 700 volumes of manga, according to Amazon estimates. It was (way) more than enough for the manga and comics in my existing collection. One minor issue with the Kindle line in general is how the devices take a bit of time between dense e-paper image refreshes. It's hardly a deal-breaker, but the lag might grate as you try to flip through dialog-light action or scene-setting vistas. The Paperwhite Manga edition improves on this in two ways. First, there's that 33 percent speed increase on page turns. While I wasn't able to measure this down to the millisecond or what have you, it's noticeably faster. It seems less like the display is quicker to update, and that the touch panel is more responsive. Then there's a fast-forward feature. Just hold the far left of a page, and the Kindle will bound through comics at a speed of around seven pages per second. You're not expected to read that fast, but it offers a speedier way to navigate through a medium that doesn't offer much menu-based navigation. Unfortunately, this feature didn't work on the western graphic novels and comics I tested -- you'll still have to tap your way through the pages. Better still, both of these speed improvements are now part of the latest firmware update being delivered to existing Kindles, including the $80 version, the Kindle Paperwhite (6th generation or later), Kindle Voyage and Kindle Oasis. If you update your Kindle this month, you should see the difference. It does, however, diminish the benefits of the Manga edition for those who already own a recent Kindle device. Another note about reading manga (or comics) on Kindle hardware: Another part of the software update allows you to double-tap on individual comic panels to expand them to full-screen. You can also pinch to zoom, making reading and navigating through picture heavy books much easier. So who is the Kindle Manga edition for? While the idea of a comic-specific Kindle is pretty tempting, the reality is that you're probably fine with your existing Kindle, especially with that free software update mentioned above. This Manga edition is aimed at those owning or growing a pretty substantial manga library. (Manga, not western comics.) I own about 25 different volumes, but storage-wise my old Paperwhite is more than enough for me. 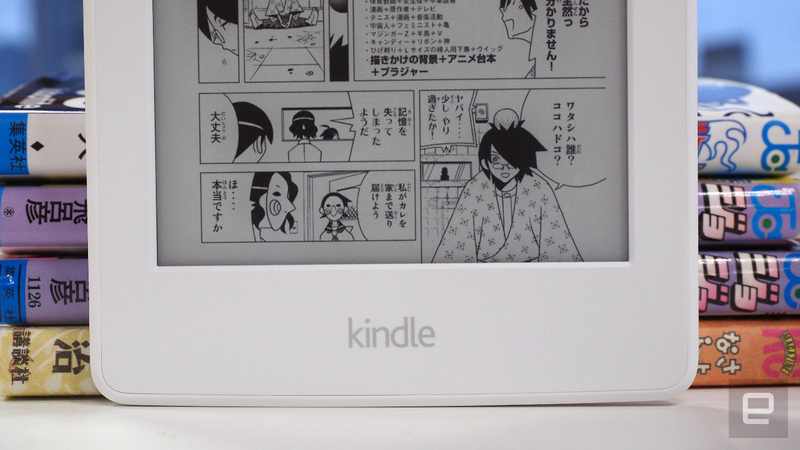 It's definitely a Japan-specific e-reader, but those looking for an e-ink comic reader for their entire manga library -- bought through Amazon, I may add -- it may be worth the extra few thousand yen (a few bucks) more. You'll just have to figure out how to import one.